A man who lost his mother, brother and sister is speaking out after police arrest the believed gunman. Austin Carter reports. 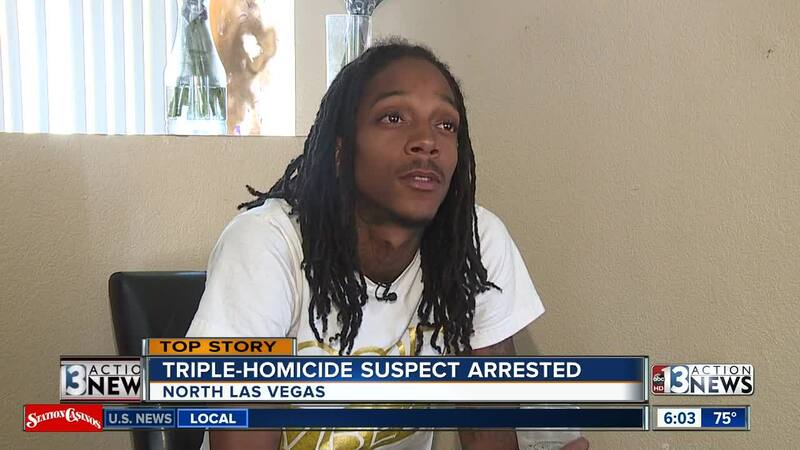 A man who lost his mother, sister and brother in a triple homicide is speaking out after police made an arrest in the case. The Nash family was shattered in seconds Sunday night when three family members were shot and killed. Deandre Nash describes it as unimaginable, as he looked through the pictures of his mother, sister, and brother who were gunned down. “There’s no words for this, all three of them, there’s just no words for this,” Nash said. The shooting happened around 9 p.m. Sunday inside this shopping plaza near Lake Mead Boulevard and Simmons Street. Nash said he was there with his mom, 52-year-old Susan Nash, for a date night at Dotty’s. His mother Susan, brother Deonte Nash and his sister Dejona'e Nash were in the parking lot, according to Nash, when the shots rang out. “My brother came to the door and said he just killed our whole family. I didn’t believe it but it was our whole family,” Nash said. They were all pronounced dead at the scene, according to officers, with another victim, one of Deandre's brothers, was also shot but he survived. Three days followed until the as the suspect, 41-year-old Jose Easley Jr., was captured by police. However, the arrest has not brought any closure to the family. He said this loss has hit the entire community and has left his family having to bury three of their own. Nash added that there was just no reason for this to happen. The family has created a GoFundMe account to assist with expenses after this stunning loss.